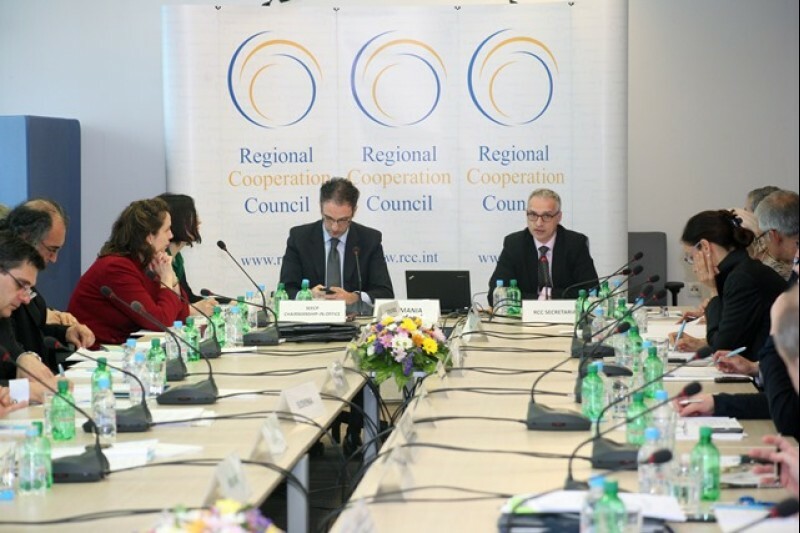 SARAJEVO, 24 April 2014 – The Regional Cooperation Council (RCC) Board accepted the Annual Report of the RCC Secretary General on regional cooperation in South East Europe in the period 2013-2014 at its 23rd meeting held in Sarajevo, Bosnia and Herzegovina, today. The RCC Board has also heard the report by the Secretary General on activities of the organisation’s Secretariat in the period January-March 2014, the assessment of the implementation of the RCC Strategy and Work Programme 2011–2013 as well as information on the future plans. This period was mostly characterised by the process of starting the implementation of RCC’s new Strategy and Work Programme (SWP) 2014–2016 and its central pillar - the South East Europe 2020 Strategy (SEE 2020). The information about the yesterday-held 15th Coordination Meeting of the Troika of the South-East European Cooperation Process (SEECP), currently chaired by Romania, the RCC Secretariat and the European Union was presented to the Board members. Furthermore, on 23 April, the 1st meeting of the Ad-Hoc Working Group on the future of SEECP under the Romanian SEECP Chairmanship-in-Office took place in the premises of the RCC Secretariat. The topics discussed at the first meeting included: strengthening of the SEECP role; improvement of cooperation between the RCC and SEECP; improvement of SEECP functioning; and consolidation of SEECP priority areas.